Avice, G., Bekaert, D.V., Chennaoui Aoudjehane, H., Marty, B. (2018) Noble gases and nitrogen in Tissint reveal the composition of the Mars atmosphere. Geochem. Persp. Let. 6, 11–16. ERC (grants no. 267255 and 69618 to B.M.). Comparative planetology is crucial to unravel the origin and evolution of volatile elements on terrestrial planets. We report precise measurements of the elemental and isotopic composition of nitrogen and noble gases in the Martian meteorite Tissint. Ar-N2 correlations confirm discrepancies between results from Viking and Martian meteorites and those from the Mars Science Laboratory (MSL) mission. The Martian atmospheric 40Ar/36Ar ratio is estimated to be 1714 ± 170 (1σ), lower than the value determined by Viking but in agreement with, and with higher precision than, data from MSL. We confirm a solar wind-like origin for Martian Kr and Xe. Excesses on light Kr isotopes are lower than those measured by MSL. Cosmogenic excesses in the Xe isotopic spectrum could have been produced in space during exposure of the Tissint parent body to cosmic rays. Figure 1 N-Ar isotope plots. (a) δ15N vs. 36Ar/14N mixing diagram. The line corresponds to the relationship between an end-member with low δ15N and 36Ar/14N values, and the Mars atmosphere with elevated isotope and elemental ratios and was computed using Isoplot software (courtesy of K. Ludwig, Berkeley Geochronology Center). Dashed lines correspond to 1σ error envelope. (b) Same as (a) but with the 40Ar/14N ratio. (c) Expanded view of (b) showing results from Viking (Owen et al., 1977) and MSL (Wong et al., 2013). Tissint data are compatible with the 40Ar/14N ratio defined by Viking. Errors correspond to 1σ. Figure 2 Three isotope plot of Xe measured in Tissint samples. Data define a mixing trend between the terrestrial (Ozima and Podosek, 2002) and Martian atmospheres (Mathew et al., 1998). Chassigny is from Ott (1988) and is comparable to SW-Xe (Meshik et al., 2014). Chondritic (Q-Xe) from Busemann et al. (2000). New results from the MSL mission (Conrad et al., 2016) have similar 136Xe/132Xe but higher 129Xe/132Xe than previous studies. Errors correspond to 1σ. Figure 3 Isotope composition of Xe and Kr in Tissint. (a) Isotope spectrum of Xe released from sample Glass 3. The isotopic compositions of Xe measured by MSL (Conrad et al., 2016) and in other Martian meteorites (Mathew et al., 1998) are also displayed. All data are normalised to 132Xe and to SW-Xe (Meshik et al., 2014) and expressed in delta notation: δiXe = 1000 * [(iXe/132Xe)/( iXe/132Xe)SW-Xe - 1]. 129Xe excesses relative to SW-Xe are shown in the top-right sub-panel. Xe isotope spectra corrected for terrestrial Xe, for 1 Myr and 0.7 Myr of cosmic-ray exposure are also shown. (b) Isotope spectra of Kr extracted from sample glass compared to results obtained on lithology C (glass) of the EETA79001 meteorite (Swindle et al., 1986) and in situ by MSL (Conrad et al., 2016). Terrestrial Kr (Ozima and Podosek, 2002) is shown for comparison. Data are expressed in delta notation relative to solar-wind Kr (Meshik et al., 2014). Errors correspond to 1σ. Table 1 Range of values proposed for the elemental and isotope composition of the Martian atmosphere. The agreement between meteorites and Viking mission data suggests that the Ar/N ratio determined by Viking is correct (Owen et al., 1977). 40Ar/36Ar ratios from this study and from in situ measurements reported in Mahaffy et al. (2013). For 124-126Xe/132Xe ratios, we propose the values determined in this study for two different CRE ages (0.7 and 1 Ma). Values for 128-136Xe/132Xe ratios from Conrad et al. (2016). Krypton values from Swindle et al. (1986). Errors correspond to 1σ. Becker, R.H., Pepin, R.O. (1984) The case for a Martian origin of the shergottites: Nitrogen and noble gases in EETA 79001. Earth and Planetary Science Letters 69, 225-242. Marti, K., Kim, J.S., Thakur, A.N., McCoy, T.J., Keil, K. (1995) Signatures of the Martian atmosphere in glass of the Zagami meteorite. Science 267, 1981-1984. Murty, S., Mohapatra, R.K. (1997) Nitrogen and heavy noble gases in ALH 84001: Signatures of ancient Martian atmosphere. Geochimica et Cosmochimica Acta 61, 5417-5428. Bogard, D.D., Garrison, D.H. (1998) Relative abundances of argon, krypton, and xenon in the Martian atmosphere as measured in Martian meteorites. Geochimica et Cosmochimica Acta 62, 1829-1835. Chennaoui Aoudjehane, H., Avice, G., Barrat, J.A., Boudouma, O., Chen, G., Duke, M.J.M., Franchi, I.A., Gattacceca, J., Grady, M.M., Greenwood, R.C., Herd, C.D.K., Hewins, R., Jambon, A., Marty, B., Rochette, P., Smith, C.L., Sautter, V., Verchovsky, A., Weber, P., Zanda, B. (2012) Tissint Martian Meteorite: A Fresh Look at the Interior, Surface, and Atmosphere of Mars. Science 338, 785-788. Cartwright, J.A., Ott, U., Herrmann, S., Agee, C.B. (2014) Modern atmospheric signatures in 4.4 Ga Martian meteorite NWA 7034. Earth and Planetary Science Letters 400, 77-87. Wiens, R.C., Becker, R.H., Pepin, R.O. (1986) The case for a Martian origin of the shergottites, II. Trapped and indigenous gas components in EETA 79001 glass. Earth and Planetary Science Letters 77, 149-158. Owen, T., Biemann, K., Rushneck, D.R., Biller, J.E., Howarth, D.W., Lafleur, A.L. (1977) The composition of the atmosphere at the surface of Mars. Journal of Geophysical Research 82, 4635-4639. Treiman, A.H., Gleason, J.D., Bogard, D.D. (2000) The SNC meteorites are from Mars. Planetary and Space Science 48, 1213-1230. Mahaffy, P.R., Webster, C.R., Atreya, S.K., Franz, H., Wong, M., Conrad, P.G., Harpold, D., Jones, J.J., Leshin, L.A., Manning, H., Owen, T., Pepin, R. O., Squyres, S., Trainer, M., MSL Science Team (2013) Abundance and Isotopic Composition of Gases in the Martian Atmosphere from the Curiosity Rover. Science 341, 263-266. Wong, M.H., Atreya, S.K., Mahaffy, P.N., Franz, H.B., Malespin, C., Trainer, M.G., Stern, J.C., Conrad, P.G., Manning, H.L.K., Pepin, R.O., Becker, R.H., McKay, C.P., Owen, T.C., Navarro-González, R., Jones, J.H., Jakosky, B.M., Steele, A. (2013) Isotopes of nitrogen on Mars: Atmospheric measurements by Curiosity's mass spectrometer. Geophysical Research Letters 40, 6033-6037. 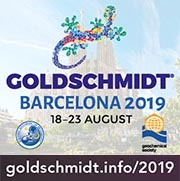 Conrad, P.G., Malespin, C.A., Franz, H.B., Pepin, R.O., Trainer, M.G., Schwenzer, S.P., Atreya, S.K., Freissinet, C., Jones, J.H., Manning, H., Owen, T., Pavlov, A.A., Wiens, R.C., Wong, M.H., Mahaffy, P.R. (2016) In situ measurement of atmospheric krypton and xenon on Mars with Mars Science Laboratory. Earth and Planetary Science Letters 454, 1-9. Pepin, R.O. (1991) On the origin and early evolution of terrestrial planet atmospheres and meteoritic volatiles. Icarus 92, 2-79. Avice, G., Marty, B., Burgess, R. (2017) The origin and degassing history of the Earth's atmosphere revealed by Archean xenon. Nature Communications 8, 1-9. Rao, M. (2002) Neutron Capture Isotopes in the Martian Regolith and Implications for Martian Atmospheric Noble Gases. Icarus 156, 352-372.
noted that krypton and xenon trapped in Martian meteorites do not present such excesses. Chennaoui Aoudjehane, H., Jambon, A., Reynard, B., Blanc, P. (2005) Silica as a shock index in shergottites: A cathodoluminescence study. Meteoritics and Planetary Science 40, 967-979. Shukolyukov, Y.A., Nazarov, M.A., Schultz, L. (2002) A New Martian Meteorite: the Dhofar 019 Shergottite with an Exposure Age of 20 Million Years. Solar System Research 36, 125-135. ), resulting in a low contribution of cosmogenic Xe isotopes. Careful measurement of the light Xe and Kr isotopes may thus permit the occurrence of spallogenic noble gas isotopes in the Martian atmosphere to be tested. Zimmermann, L., Avice, G., Blard, P.-H., Marty, B., Füri, E., Burnard, P.G. (2017) A new all-metal induction furnace for noble gas extraction. Chemical Geology, doi: 10.1016/j.chemgeo.2017.09.018. Bekaert, D.V., Avice, G., Marty, B., Henderson, B. (2017) Stepwise heating of Lunar anorthosites 60025, 60215, 65315 possibly reveals an indigenous noble gas component on the Moon. Geochimica et Cosmochimica Acta 218, 114-131. Results for the chemical composition of a Tissint sample are given in Table S-1. N/Ar isotope and elemental data define a linear trend between a component with a low δ15N (10–20 ‰ for 40-36Ar/14N ~ 0) and another component with elevated δ15N and 40-36Ar/14N values (Fig. 1, Table S-2) released at higher temperature. For Kr and Xe results, the reference for the Martian atmospheric record in meteorites is taken from Mathew et al. (1998). Mathew, K.J., Kim, J.S., Marti, K. (1998) Martian atmospheric and indigenous components of xenon and nitrogen in SNC meteorites. Meteoritics and Planetary Science 33, 655-664. Meshik, A., Hohenberg, C., Pravdivtseva, O., Burnett, D. (2014) Heavy noble gases in solar wind delivered by Genesis mission. Geochimica et Cosmochimica Acta 127, 326-347. ). 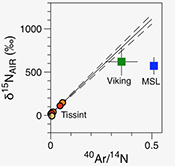 Tissint data are compatible with the 40Ar/14N ratio defined by Viking. Errors correspond to 1σ. Ozima, M., Podosek, F.A. (2002) Noble Gas Geochemistry. Second Edition, Cambridge University Press, Cambridge. Ott, U. (1988) Noble gases in SNC meteorites: Shergotty, Nakhla, Chassigny. Geochimica et Cosmochimica Acta 52, 1937-1948. Busemann, H., Baur, H., Wieler, R. (2000) Primordial noble gases in “phase Q” in carbonaceous and ordinary chondrites studied by closed‐system stepped etching. Meteoritics and Planetary Science 35, 949-973.
) have similar 136Xe/132Xe but higher 129Xe/132Xe than previous studies. Errors correspond to 1σ. Swindle, T.D., Caffee, M.W., Hohenberg, C.M. (1986) Xenon and other noble gases in shergottites. Geochimica et Cosmochimica Acta 50, 1001-1015. ). Errors correspond to 1σ. Wieler, R., Huber, L., Busemann, H., Seiler, S., Leya, I., Maden, C., Masarik, J., Meier, M.M.M., Nagao, K., Trappitsch, R., Irving, A.J. (2016) Noble gases in 18 Martian meteorites and angrite Northwest Africa 7812-Exposure ages, trapped gases, and a re-evaluation of the evidence for solar cosmic ray-produced neon in shergottites and other achondrites. Meteoritics and Planetary Science 51, 407-428. Wiens, R.C., Pepin, R.O. (1988) Laboratory shock emplacement of noble gases, nitrogen, and carbon dioxide into basalt, and implications for trapped gases in shergottite EETA 79001. Geochimica et Cosmochimica Acta 52, 295-307. Franz, H.B., Trainer, M.G., Wong, M.H., Mahaffy, P.R. (2015) Reevaluated Martian atmospheric mixing ratios from the mass spectrometer on the Curiosity rover. Planetary and Space Science 109-110, 154-158. Krasnopolsky, V.A. (2017) Annual mean mixing ratios of N2, Ar, O2, and CO in the martian atmosphere. Planetary and Space Science 144, 71-73. Bogard, D.D., Clayton, R.N., Marti, K., Owen, T., Turner, G. (2001) Martian volatiles: Isotopic composition, origin, and evolution. Space Science Reviews 96, 425-458. Garrison, D.H., Bogard, D.D. (1998) Isotopic composition of trapped and cosmogenic noble gases in several Martian meteorites. Meteoritics and Planetary Science 33, 721-736. Holland, G., Cassidy, M., Ballentine, C.J. (2009) Meteorite Kr in Earth's Mantle Suggests a Late Accretionary Source for the Atmosphere. Science 326, 1522-1525. Caracausi, A., Avice, G., Burnard, P.G., Füri, E., Marty, B. (2016) Chondritic xenon in the Earth’s mantle. Nature 533, 82-85. Dauphas, N., Pourmand, A. (2011) Hf–W–Th evidence for rapid growth of Mars and its status as a planetary embryo. Nature 473, 489-492. Wang, H., Weiss, B.P., Bai, X.-N., Downey, B.G., Wang, J., Wang, J., Suavet, C., Fu, R.R., Zucolotto, M.E. (2017) Lifetime of the solar nebula constrained by meteorite paleomagnetism. Science 355, 623-627. Jacobson, S.A., Morbidelli, A., Raymond, S.N., O'Brien, D.P., Walsh, K.J., Rubie, D.C. (2014) Highly siderophile elements in Earth’s mantle as a clock for the Moon-forming impact. Nature 508, 84-87. Marty, B. (2012) The origins and concentrations of water, carbon, nitrogen and noble gases on Earth. Earth and Planetary Science Letters 313-314, 56-66. Hébrard, E., Marty, B. (2014) Coupled noble gas-hydrocarbon evolution of the early Earth atmosphere upon solar UV irradiation. Earth and Planetary Science Letters 385, 40-48. Chaffin, M.S., Chaufray, J.-Y., Stewart, I., Montmessin, F., Schneider, N.M., Bertaux, J.-L. (2014) Unexpected variability of Martian hydrogen escape. Geophysical Research Letters 41, 314-320. Cassata, W.S. (2017) Meteorite constraints on Martian atmospheric loss and paleoclimate. Earth and Planetary Science Letters 479, 322-329. Jakosky, B.M., Slipski, M., Benna, M., Mahaffy, P., Elrod, M., Yelle, R., Stone, S., Alsaeed, N. (2017) Mars’ atmospheric history derived from upper-atmosphere measurements of 38Ar/36Ar. Science 355, 1408-1410.
) suggesting that – at least the lightest – noble gases are still escaping from the Martian atmosphere. Mechanisms responsible for Xe escape remain to be explored through theoretical or modelling studies to understand why Mars and Earth, presenting such different physical and chemical parameters, exhibit comparable depletion and isotope fractionation of atmospheric xenon.
. Overall, our data cannot exclude that spallation-derived Xe is present in the Mars atmosphere. Swindle, T.D (2002) Martian noble gases. In: Porcelli, D., Ballentine, C.J., Wieler, R. (Eds.) Reviews in Mineralogy and Geochemistry Volume 47. Mineralogical Society of America, Washington D.C., 171-190. At the time of the impact responsible for its ejection from the Martian crust into space, the Tissint parent body recorded the elemental and isotopic compositions of the Martian atmosphere. Overall, Tissint data are in agreement with in situ measurements on Mars with, for example, a 40Ar/36Ar ratio of about 1714 ± 170 (1σ) and a Martian Xe ultimately derived from SW Xe by mass-dependent isotope fractionation. However, several discrepancies still remain. First, SNC data point toward an Ar/N ratio lower than the value measured by MSL and close to the original value measured by the Viking mission. Uncertainties in cosmogenic production rates and isotope ratios for Xe prevent conclusions being drawn on the presence of spallation Xe in the Mars atmosphere but Kr data show a modest contribution of the spallation component compared to results obtained in situ. Our preferred values for the composition of the Martian atmosphere (Table 1) will likely become more precise when additional measurements of Martian gases analysed in situ or in new Martian meteorites become available.
. Errors correspond to 1σ. L. Ferrière and the Natural History Museum, Vienna kindly provided some samples (NHMW_#7996_35a3a and NHMW_#7996_35a3b). We thank three anonymous reviewers for their comments and Liane G. Benning for editorial handling. This study was supported by the European Research Council (grants no. 267255 and 69618 to B.M.). L. Zimmermann is thanked for N-Ar measurements. CRPG contribution #2546. When such fractionation is corrected for, a solar-like composition is obtained for the progenitor of Martian atmospheric Xe, contrary to the case of terrestrial Xe, which requires a different initial composition labelled U-Xe (Pepin, 1991; Avice et al., 2017). This observation differs from hypotheses on the origin of heavy noble gases on Earth with chondritic sources identified in the Earth's mantle (Holland et al., 2009; Caracausi et al., 2016) and a U-Xe initial isotopic composition for atmospheric Xe (Pepin, 1991; Avice et al., 2017). Studies of Archean rocks on Earth suggest that a prolonged atmospheric escape of Xe ions lifted by H ions acted on Earth and led to the fractionation observed today (Hébrard and Marty, 2014; Avice et al., 2017). Some of these (e.g., EETA 79001, Zagami, ALH84001, Tissint, NWA 7034) contain glassy melt pockets or veins created during impacts on Mars that ejected fragments of Martian crust into space (Becker and Pepin, 1984; Marti et al., 1995; Murty and Mohapatra, 1997; Bogard and Garrison, 1998; Chennaoui Aoudjehane et al., 2012; Cartwright et al., 2014). Melt pockets present noble gases and nitrogen compositions (e.g., Becker and Pepin, 1984; Wiens et al. 1986) comparable to those measured on Mars by the Viking lander (Owen et al., 1977), strongly supporting their Martian origin (Treiman et al., 2000). The component with low δ15N values probably corresponds to the Earth's atmosphere (δ15NAIR = 0 ‰) although a contribution from a Martian interior component with δ15NAIR between -20 ‰ and 0 ‰ cannot be excluded (Becker and Pepin, 1984). Errors were propagated following the method described by Bekaert et al. (2017). Some of these (e.g., EETA 79001, Zagami, ALH84001, Tissint, NWA 7034) contain glassy melt pockets or veins created during impacts on Mars that ejected 7fragments of Martian crust into space (Becker and Pepin, 1984; Marti et al., 1995; Murty and Mohapatra, 1997; Bogard and Garrison, 1998; Chennaoui Aoudjehane et al., 2012; Cartwright et al., 2014). It is also in agreement with a previous value defined by measurements on SNCs (1800 ± 100) (Bogard et al., 2001). Figure 2 [...] Chondritic (Q-Xe) from Busemann et al. (2000). Excesses of spallation-derived Kr detected in the Martian meteorite NWA 7034 (Cartwright et al., 2014) have been interpreted as evidence of incorporation of Martian regolith in NWA 7034. Despite evidence from the MAVEN mission for active – but variable – modern H escape (Chaffin et al., 2014), meteorite studies suggest that escape of atmospheric Xe ceased much earlier (4.2–4.3 Gyr ago) on Mars relative to Earth (Cassata et al., 2017). Tissint has a low cosmic-ray exposure age of 0.7 ± 0.3 Ma (Chennaoui Aoudjehane et al., 2012) compared to other Martian meteorites (up to 20 Ma; Shukolyukov et al., 2002), resulting in a low contribution of cosmogenic Xe isotopes. Gases were extracted by step-heating using a CO2 laser extraction setup and measured on a VG5400® mass spectrometer at CRPG (Nancy, France) (Chennaoui Aoudjehane et al., 2012). Martian atmospheric Xe measured by SAM (Conrad et al., 2016) is mass-dependently fractionated, i.e. enriched in heavy isotopes relative to light ones, by 3–4 % per amu, a value comparable to that of terrestrial atmospheric Xe. Interestingly, SAM measurements also revealed isotopic excesses of 124,126Xe and 80-82Kr isotopes (Conrad et al., 2016). However, Conrad et al. (2016) noted that krypton and xenon trapped in Martian meteorites do not present such excesses. Figure 2 [...] New results from the MSL mission (Conrad et al., 2016) have similar 136Xe/132Xe but higher 129Xe/132Xe than previous studies. 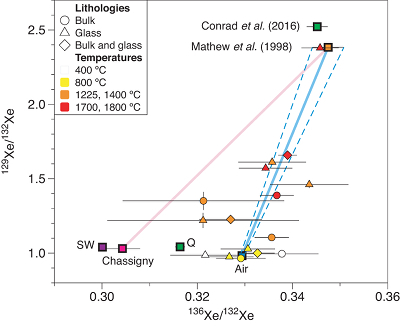 Figure 3 [...] The isotopic compositions of Xe measured by MSL (Conrad et al., 2016) and in other Martian meteorites (Mathew et al., 1998) are also displayed. Figure 3 [...](b) Isotope spectra of Kr extracted from sample glass compared to results obtained on lithology C (glass) of the EETA79001 meteorite (Swindle et al., 1986) and in situ by MSL (Conrad et al., 2016). In agreement with previous studies (e.g., Garrison and Bogard, 1998; Mathew et al., 1998; Conrad et al., 2016), Martian atmospheric Xe measured in sample Glass 3 is related by mass-dependent isotope fractionation (Pepin, 1991) to Solar Wind Xe (SW-Xe, Meshik et al., 2014). This initial isotope composition does not leave space for a contribution of 244Pu-derived fissiogenic Xe (Ozima and Podosek, 2002) to the Martian atmosphere (Conrad et al., 2016) since the mass-fractionation of SW-Xe already matches the isotope composition of Martian atmospheric Xe. When taking a CRE age of 0.7 Ma, the corrected 126Xe/132Xe ratio is similar to the value given by Mathew et al. (1998) but also comparable to the value given by Conrad et al. (2016). 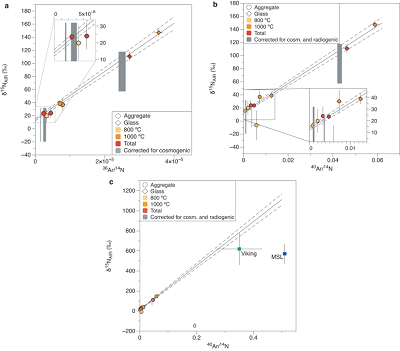 Light Kr isotope ratios present low cosmogenic excesses compared to results obtained in situ by SAM (Conrad et al., 2016) (Fig. 3b). If Tissint does not contain any cosmogenic Kr produced in space, the maximum 80Kr/84Kr is about 0.048, ≈30 % lower than the value proposed by Conrad et al. (2016). Interestingly, Conrad et al. (2016) pointed out the presence of hydrocarbons preventing interpretations of 78Kr data. Table 1 [...] Values for 128-136Xe/132Xe ratios from Conrad et al. (2016). Mars is believed to have accreted ≤2.7 Myr after the start of solar system formation (Dauphas and Pourmand, 2011), when gas from the protosolar nebula was likely to be present (Wang et al., 2017). The MSL 40Ar/14N ratio is 0.51 ± 0.01 (Mahaffy et al., 2013) even after updating calibrations of the SAM instrument (Franz et al., 2015). On Earth, the impact responsible for the formation of the Moon happened <100 Myr after the formation of the solar system (Jacobson et al., 2014) and probably erased most of the signatures of volatiles from the protosolar nebula even if some are still persistent in the Earth's mantle (e.g., He and Ne evidence reviewed by Marty, 2012). Modern escape of Martian atmospheric argon by pickup-ion sputtering has also been detected (Jakosky et al., 2017) suggesting that – at least the lightest – noble gases are still escaping from the Martian atmosphere. Seasonal variations cannot account for changes in the Ar/N ratio given the long lifetimes (>1 Gyr) of Ar and N2 in the Martian atmosphere (Krasnopolsky, 2017). Data from the Samples Analysis at Mars (SAM) instrument suite on-board the Curiosity rover (MSL mission, NASA) provided a new reference value for the Martian atmospheric 40Ar/36Ar ratio of 1900 ± 300 (1σ) (Mahaffy et al., 2013), only 63 % of the value measured by Viking (40Ar/36Ar = 3000; Owen et al., 1977). This minimum value is more precise than and in excellent agreement with the value of 1900 ± 300 (1σ) determined by MSL (Mahaffy et al., 2013). Table 1 [...] 40Ar/36Ar ratios from this study and from in situ measurements reported in Mahaffy et al. (2013) . Xe released during the high temperature step on sample Glass 3, with a 129Xe/132Xe ratio of 2.38 ± 0.01 (1σ), has an isotopic composition (Fig. 3a) very close to that of the Martian atmosphere previously defined (Mathew et al., 1998). Figure 2 [...] Data define a mixing trend between the terrestrial (Ozima and Podosek, 2002) and Martian atmospheres (Mathew et al., 1998). A 1 Ma exposure age leads to an unrealistic low δ126Xe of -475 ‰ (Fig. 3a) since the minimum value from either meteorite or in situ data is -140 ‰ (Mathew et al., 1998). Krypton extracted at higher temperature (1225 °C and 1700 ºC) is enriched in light isotopes and depleted in heavy isotopes compared to the solar composition (Meshik et al., 2014) (Fig. 3b). Figure 2 [...] Chassigny is from Ott (1988) and is comparable to SW-Xe (Meshik et al., 2014). Figure 3 [...] All data are normalised to 132Xe and to SW-Xe (Meshik et al., 2014) and expressed in delta notation: δiXe = 1000 * [(iXe/132Xe)/( iXe/132Xe)SW-Xe - 1]. Figure 3 [...] Data are expressed in delta notation relative to solar-wind Kr (Meshik et al., 2014). These could also have interfered with 80Kr (m/z = 80) measurements as well as "change-of-charge" effects involving energetic 40Ar+ ions (Meshik et al., 2014). Figure 1 [...] (c) Expanded view of (b) showing results from Viking (Owen et al., 1977) and MSL (Wong et al., 2013). Indeed, the mixing trend when extended to higher 40-36Ar/N ratios intercepts the value of the Martian atmosphere determined by Viking (40Ar/14N = 0.35 ± 0.08; Owen et al., 1977). The original value of 3000 ± 500 determined by the Viking mission (Owen et al., 1977) was probably over-estimated. Table 1 [...] The agreement between meteorites and Viking mission data suggests that the Ar/N ratio determined by Viking is correct (Owen et al., 1977). Figure 3 [...] Terrestrial Kr (Ozima and Podosek, 2002) is shown for comparison. Even if temperature steps up to 1225 ºC can be accounted for by mixing between the terrestrial atmosphere (Ozima and Podosek, 2002) and the Martian atmosphere (taking Kr/Xe from Swindle, 2002) (Fig. S-1), 1700 ºC temperature steps have too low 80Kr/84Kr ratios for a given 129Xe/132Xe. When such fractionation is corrected for, a solar-like composition is obtained for the progenitor of Martian atmospheric Xe, contrary to the case of terrestrial Xe, which requires a different initial composition labelled U-Xe (Pepin, 1991, Avice et al, 2017). Produced isotopes would have been subsequently degassed into the Martian atmosphere (Rao, 2002). Table 1 [...] Kr values from Swindle et al. (1986). A cosmic-ray exposure (CRE) age of 1 Ma is considered to correct for cosmogenic noble gas and nitrogen isotopes produced in space by galactic cosmic rays (Wieler et al., 2016 and Supplementary Information). From previous laboratory experiments on shock implantation of atmospheric gases on terrestrial basalts, it appears unlikely that the impact event on Mars could have fractionated isotope or elemental ratios of Ar and N2 during their implantation into the glass phase produced upon impact (Wiens and Pepin, 1988). Melt pockets present noble gases and nitrogen compositions (e.g., Becker and Pepin, 1984; Wiens et al., 1986) comparable to those measured on Mars by the Viking lander (Owen et al., 1977), strongly supporting their Martian origin (Treiman et al., 2000). SAM also measured a Ar/N ratio of 0.51 ± 0.01 (Wong et al., 2013), whereas SNC and Viking analyses were similar and pointed to a lower Ar/N ratio of about 0.35. Our new data confirm a discrepancy previously noted by Wong et al. (2013), that the isotope and elemental compositions determined by the SAM instrument on-board MSL fall below the mixing trend defined by SNC data (Fig. 1c). Taking a δ15N value of 572 ± 82 ‰ (1σ) (Wong et al., 2013) and an Ar/N ratio between 0.35 and 0.51 (see above) for the Martian atmosphere, correlations using all temperature steps give a value of 1714 ± 170 (1σ) for the Martian atmospheric 40Ar/36Ar ratio uncorrected for cosmogenic 36Ar. Gases were extracted using two induction furnaces (Zimmermann et al., 2017) and measured on a Helix MC Plus® (Thermofisher Scientific) mass spectrometer at CRPG (Supplementary Information). A recent study updated the N2 calibration constant of the SAM Quadrupole Mass spectrometer of the Curiosity rover (Franz et al., 2017). After correction, the 40Ar/14N ratio measured by MSL is 0.37 ± 0.01. This value is in closer agreement with results obtained by the Viking mission and by studies of gas contained in SNC meteorites including Tissint (this study). Franz, H.B., Trainer, M.G., Malespin, C.A., Mahaffy, P.R., Atreya, S.K., Becker, R.H., Benna, M., Conrad, P.G., Eigenbrode, J.L., Freissinet, C., et al. (2017) Initial SAM Calibration Gas Experiments on Mars: Quadrupole Mass Spectrometer Results and Implications. Planetary and Space Science 138, 44-54, doi: 10.1016/j.pss.2017.01.014. 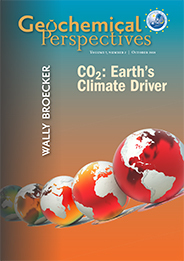 Download the Supplementary Information (PDF).